← Kids Halaqa session (5): Pumpkin Party! A fun activity to help my Year 9 girls learn 20 Verbs mentioned in the Qur’an. I’ve only picked 20 to make it easy for the girls as most of them get a lot of homework from school. I think a crossword puzzle will help them see which ones they can remember and which ones they need to sit down and learn. I hope you find this resource useful insha Allah! Please Like the facebook page and Pinterest page to keep updated! 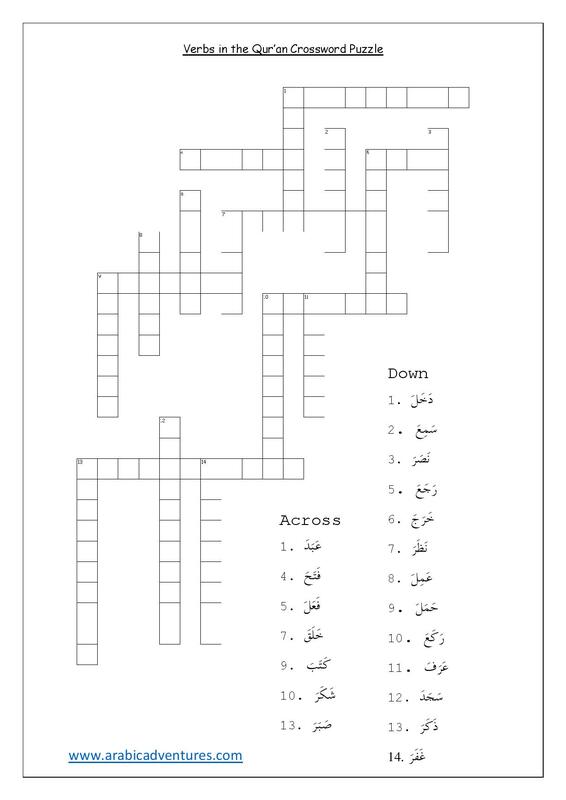 This entry was posted in Arabic worksheets, Games and tagged arabic games, arabic grammar, arabic grammar review, Arabic language resources, Arabic verbs, arabic verbs crossword, islamic printables, Qur'anic Arabic, Qur'anic arabic verbs, quran crossword, Quran curriculum, quran syllabus, verbs in the qur'an. Bookmark the permalink. Yes, I have the same problem. I couldn’t get them right!!!! please help.